Shipping at Spithead, Francis Holman, date unknown (1770's? ), John Bennett Fine Paintings via Online Art Gallery. 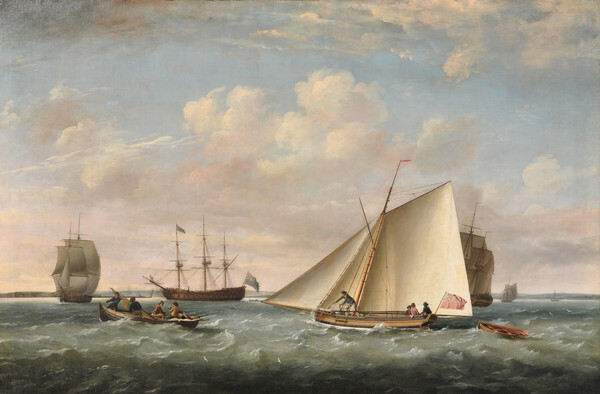 Francis Holman paints a pleasant scene of various vessels in a steady breeze off Spithead. A sixty gun ship of the line with her starboard guns broadside to us is lateen rigged on her mizzenmast and blue ensign run up. Just peeking behind the sail of the Thetis sloop is the top armor of a frigate. Otherwise the vessels in the scene are merchantmen. The Thetis is a swift little sloop with two fellows crowded in the back by the coxswain (I say coxswain and not helmsman because I see no wheel and assume there to be a tiller). One of these men is apparently not a sailor. His frock coat appears rose in color, but matches the hue of the red ensign at Thetis' stern, and so is probably intended to be red. He wears a tightly bound queue and his wig is clubbed. Sitting across from him is a man in a red frock coat and gold or yellowish brown single breasted waistcoat. Both gentlemen have round hats. It is these men who give me my tentative date for this piece, as their fashions are in line with those of the 1770's. I am no expert in the clothing of gentlemen from the period, so I welcome all feedback in settling the general period in which this painting was likely completed. The coxswain wears a round hat as well with a crown somewhere between cylindrical and rounded. He wears a blue jacket and has a short queue. 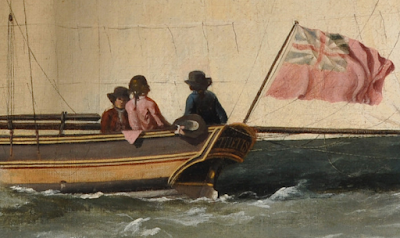 Sailors wearing queues are remarkably uncommon for my period of study, and so this is notable. Near the bow of the Thetis is another sailor with a round hat, whose brim is being turned up by the wind. He wears a single breasted blue jacket, red waistcoat, and white neckcloth. His white trousers are striped vertically in thin blue lines. Further left in the frame is a boat with four sailors aboard. 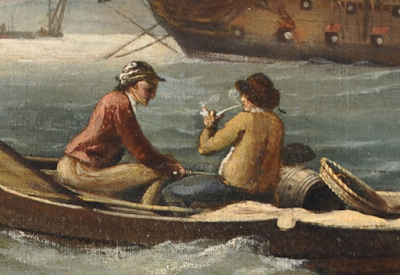 Two of these men sit at their leisure, one smoking a pipe. The smoking man wears a brown jacket, a round hat with rounded crown, and blue breeches. It appears that he might be wearing a white neckcloth, but I wouldn't swear to it. His mate wears a jockey style barge cap, red jacket with slit waist pockets, and a plain pair of trousers. 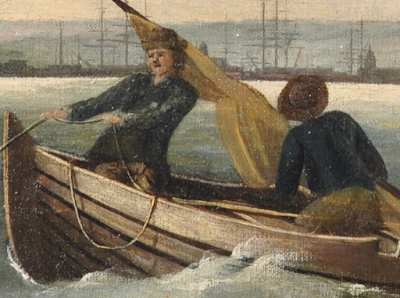 Further forward in the small boat are two men working. Each wears a blue jacket and a pair of plain trousers. 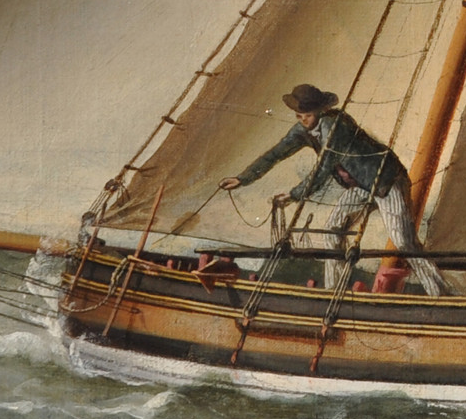 The fellow working at the small mast and sail wears a round hat, while his mate wears what might be a cap or a round hat with very narrow and upturned brim.